Note: For proper operation on the playing field at competition the subnet mask should be set back to 255.0.0.0 after imaging is complete if this PC will be used as a Driver Station. Connect the ethernet cord from the cRIO to the PC. It is sometimes helpful to use a network switch between the cRIO and PC to prevent the PC from disabling the ethernet port when the cRIO reboots. It is NOT recommended to try re-imaging over WiFi. The imaging tool will begin searching for your cRIO automatically. Select the programming language to use. LabVIEW teams are strongly recommended to check the Always run deployed code at startup checkbox. Select a CAN plugin if appropriate. Note that if you select a CAN plugin with the Console Out feature enabled, on a 4-slot cRIO-FRCII the Console Out will be disabled automatically, on an 8-slot cRIO-FRC you will see a prompt to flip the switch to disable Console Out. Check the box next to Format Controller. Verify that the image listed is FRC_2014_v52.zip (Note: The picture above shows 2013_v46). If there is no image listed in this box or the image is not v52, make sure you have installed the latest update for your programming language. Enter a name for the cRIO device. Enter your FRC team number in the Team ID box. Click Apply. The cRIO imaging tool will begin imaging your cRIO, after it is complete, you should see a message indicating that the imaging is complete and you need to load code in order to use the cRIO. For instructions on connecting the Driver Station to the cRIO for the first time and verifying connectivity see Using the Classmate with your cRIO. For instructions on writing and loading your first program see one of these documents or manuals: C++, Java, LabVIEW. Module Validation: The cRIO Imaging Tool will show the modules currently detected by the cRIO and highlight valid slots in green and invalid slots in red. Hover over any invalid or empty slot for more information about the correct module to install there. cRIO Switches: On the 8-slot cRIO-FRC this box will show the status of the hardware DIP switches, no changes can be made to the 8-slot switch configuration using this tool. For the 4-slot cRIO-FRC the hardware dip switches have been removed and replaced by virtual software switches which can be configured using the cRIO Imaging Tool. Disable all other Network Adapters on the computer. Open the Network Connections window from the Control Panel (see Network Adapter Properties step above), then for each adapter other than the Local Area Connection you are using to image the cRIO, right-click on the adapter and select Disable. Try using a network switch between the cRIO and computer: Some computers have issues reconnecting to the cRIO after the cRIO reboots as part of the imaging process. Placing a switch between the two devices, such as the D-Link DAP-1522 provided in the Kit of Parts typically mitigates this problem. Disable Windows Firewall or other firewalls: Windows Firewall may be blocking the cRIO Imaging Tool, preventing it from detecting the cRIO. If possible, temporarily disable the Firewall by following the steps below. Check that the adapter is set to a single IP address. To do this open the Network Properties as shown in the Configure Computer IP Address steps above. When you reach the last step, click the Advanced button and verify that only one address is listed in the top box. If multiple addresses are present, select the extra addresses and click Remove. If the cRIO is still not detected, try rebooting the cRIO in Safe Mode. To reboot in Safe Mode on an 8-slot cRIO, flip the Safe Mode DIP switch, then reset the cRIO. To reboot in Safe Mode on a 4-slot cRIO, hold the reset button for 5 seconds, then release. If the cRIO is detected by the imaging tool attempt to format. The tool will prompt you to take the cRIO out of Safe Mode, then try again. Try a different PC: If none of the above steps work, try using a different computer to image the cRIO. 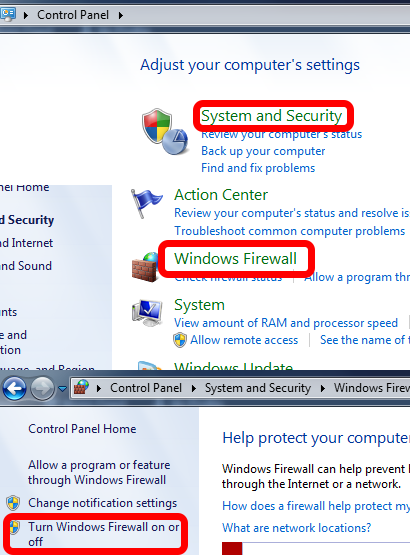 Browse to Start > Control Panel > System and Security > Windows Firewall > Turn Windows Firewall on or off. Make sure to turn the firewall off for all locations listed, then click OK.